When the average hockey fan thinks of the Pittsburgh Penguins, they likely think of the abundance of superstars they have on their roster. Sidney Crosby, Evgeni Malkin, and Kris Letang are probably the first three names that come to mind, but lately it has been a different group that has pushed the Penguins to only two points away from clinching a playoff spot. For years the Penguins struggled to find offensive depth to complement their star power in big games, but on March 31 against the Carolina Hurricanes – a game with huge playoff implications – the fourth line scored the first two goals en route to a 3-1 victory. Head coach Mike Sullivan has shuffled the fourth line constantly throughout the season trying to find the right combination that could add offensive depth without being a defensive liability, and it appears he has finally found the right trio. With 42-year-old Matt Cullen at center in between Garrett Wilson and Adam Johnson, the fourth line has found unique chemistry. The Penguins are in good shape as the playoffs near, but the fourth line will be instrumental if they want to make a deep playoff run. When the Penguins signed Cullen to a one-year, $650,000 contract in the offseason, many fans were skeptical that it was the right move. While he was instrumental to Pittsburgh’s back-to-back Stanley Cups a few years prior, signing a center in his 40s didn’t seem like the solution after being outed by a much quicker Washington Capitals team last season. As the game has seemingly gotten younger and faster, Cullen has somehow managed to keep up. Never a prolific goal scorer throughout his career, he has managed to develop other areas of his game that has allowed him to play 1,500-plus NHL games (only the second American-born player to ever reach that milestone). However, there are times where Cullen still shows his offensive touch – skip to 2:20 in the video below to see a great example. Always known as being solid at faceoffs, fundamentally sound in his own end, and a phenomenal teammate, Cullen has slowly turned into one of the Penguins’ best penalty killers, as well. After general manager Jim Rutherford traded Carl Hagelin to the Los Angeles Kings earlier this season, someone had to step up and take control of the top penalty killing unit, and that’s exactly what Cullen did. With 20 points in 68 games this season, his numbers may not stand out at first glance, but with three points in his last three games, he may just be getting hot at the right time. Cullen is not only the leader of the fourth line, but one of the leaders in the locker room, as well. At 42 years old, he has seen and done almost everything you can as a hockey player, and his play down the stretch will be crucial in terms of how deep of a playoff run the Penguins will make. While Cullen may be the main attraction on the fourth line, it’s impossible to ignore how well Wilson and Johnson have played alongside him. In the last three games, the fourth line has combined for eight points, which is more than paying their dues offensively. Almost every season there is a depth forward who steps up and plays a crucial role in his team winning the Stanley Cup. Last season for the Capitals, it was Devante Smith-Pelly. In 2009, it was Max Talbot who rose from the depths of the bottom-six for the Penguins and scored twice in Game 7 of the Stanley Cup Final. If they are going to make a serious run this season, Wilson or Johnson may be a catalyst. Since being called up from the Wilkes-Barre/Scranton Penguins, Pittsburgh’s AHL affiliate, Wilson has added a physical presence up front that they have long needed. With the addition of 6-foot-5 Erik Gudbranson on the defensive end, Wilson has now been able to shift some of his focus to contributing offensively. Instead of running around trying to hit everything that moves, he has started to show some patience with the puck and has seemingly improved every game. On the other side of Cullen, Johnson has brought a smooth stride and the speed that has allowed the fourth line to stretch the ice and make it easier to break out of the zone. Opposing defensemen have to respect his skating ability and have been less eager to pinch down the boards in the Penguins’ defensive end. In just five games, Johnson has looked far better than Joseph Blandisi did in his six-game stint trying to fill the same role. It’s no secret that the Penguins’ success will fall mostly on the shoulders of Crosby, Malkin, and goaltender Matt Murray (who almost always takes the blame), but if the fourth line can continue to play well, they might end up playing a bigger role than once thought. 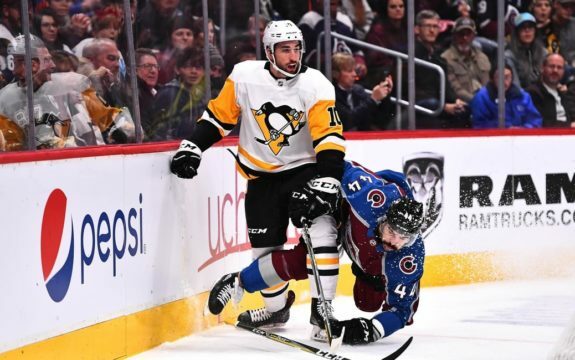 Seemingly forgettable throughout the first 70 games, the fourth line is finding their chemistry at the right time and may be the spark that helps take the Penguins to their third Stanley Cup in the last four seasons.